Spot shrimp are the largest shrimp in the North Pacific. This species is the largest of local shrimps with large females exceeding 23 cm in length. Its body color is usually reddish brown or tan, with white horizontal bars on the carapace, and distinctive white spots on the first and fifth abdominal segments. The body is generally slender and there are five pairs of "swimmerets" located on the underside of the abdomen. Spot shrimp are among the relatively few animals that are protandric hermaphrodites: each individual spends the early mature part of life as a male and later transforms into a female for the balance of its lifetime. Spot shrimp can reach sexual maturity by the third year. Some may mature sexually and spawn as a male, pass through a transitional phase and subsequently mature and spawn as a female. Some juveniles, however, never mature into males; instead, they develop directly into females. Prior to fertilization, the mature female molts into a shell specialized for carrying eggs. The eggs are attached to the female’s abdomen by hair like structures called setae. Eggs are found on females from October to March. Each spot shrimp spawns once as a male and one or more times as a female. Spawning takes place at depths of 500-700 feet. Tagging studies in Prince William Sound, Alaska, found that spot shrimp may live from seven to eleven years. Spot shrimp are opportunistic bottom feeders that tend to feed at night. They will eat a wide variety of items such as worms, diatoms, dead organic material, algae, small mollusks, sponges, and other shrimp. Spot shrimp themselves are often the diet of large predator fish such as halibut, Pacific cod, walleye pollock, flounders, and salmon. Shrimp migrate seasonally from deep to shallow waters. Juvenile spot shrimp concentrate in shallow inshore areas and migrate offshore as they mature. 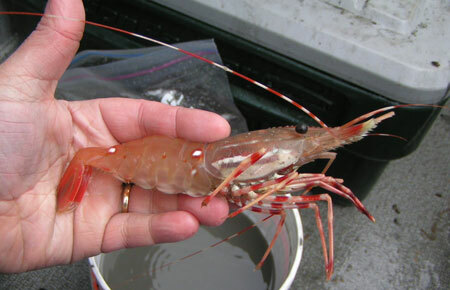 The spot prawn’s geographic range extends from Southern California to Alaska’s Aleutian Islands, around to the Sea of Japan and the Korea Strait. Spot shrimp inhabit various water depths and habitat types. At times, juveniles have been observed on muddy bottoms, but adults are generally found around rock piles, crevices, coral, on sponges, under boulders, and debris-covered bottoms. Spot shrimp seem to be caught in greatest concentrations around 60 fathoms, but range from 2 to 250 fathoms. 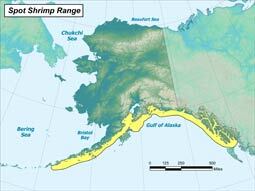 Shrimp are an important component of Alaskan marine ecosystems. They once supported large and historically important commercial fisheries in the late 1950s through the early 1980s, particularly in the central and western Gulf of Alaska. Recent commercial harvests are much smaller in volume and are predominantly from Southeast Alaska. Pot fisheries targeting spot shrimp have historically occurred in protected embayments, largely in Southeast Alaska and to a lesser extent in Prince William Sound. The pot fisheries in Southeast Alaska grew rapidly in the 1990s and are now capped at about 800,000 ib. with most of the harvest being taken in southern and central Southeast. Pot fishing in Prince William Sound had been closed since the early 1990s due to low stock abundance. This fishery reopened in 2010. Spot shrimp fisheries in Southeast Alaska are largely stable. Shrimp—harvested in the wild or produced via aquaculture—are generally characterized as among the most unsustainable of all global fisheries. Destructive fishing methods, vast quantities of bycatch, loss of habitat, and coastal pollution are only a few of the serious environmental and social problems that have been associated with the wild harvest and aquaculture of shrimp. Yet shrimp is also one of the fastest-growing and most lucrative global and domestic seafood markets. Unfortunately, the vast majority of shrimp consumers do not know that the unsustainable production and harvest of shrimp is devastating ecosystems and local communities. Moreover, they have no way of identifying or ordering sustainably produced shrimp in a restaurant or supermarket. There is a critical need to establish an ecologically certified, sustainable shrimp fishery that can be used to educate consumers, shift seafood demand to more ecologically sound products, and dramatically reduce demand for unsustainably produced seafood.